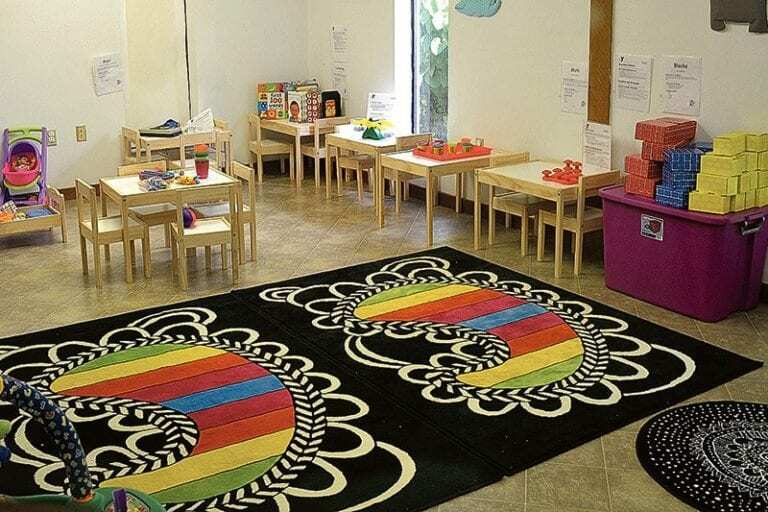 The classroom for a new early learning readiness program at the Lorena Jaeb Rainbow House is ready for students. Colorful blocks sit on top of toddler-size tables. Baby books, a kitchen play center and puzzles are just some of the learning tools ready to be utilized by children and caregivers in the community. The free program, run by the YMCA network of Tampa Bay, is designed for local children and their caregivers. Open to infants through age 5, the classes are held from 1 to 3 p.m. Tuesdays and Thursdays. “We’re basically getting the children ready for school, where they would not have the capability to by themselves,” facilitator Michelle Kolch said. In the classroom, multiple stations offer different activities to fine-tune motor skills, critical thinking and socialization. The stations vary from audio books to manipulatives, such as Play-Doh. Caregivers will have a chance to work beside their child at the different stations, learning techniques to help the child grow beyond the classroom and continue at home. At the beginning of each session, caregivers will be given a chance to watch a video as part of “Caregiver Talks.” The videos cover certain topics, such as healthy eating habits or handling temper tantrums. Caregivers then can discuss the topics in a brainstorming group. “It gives them a chance to thoroughly interact,” Kolch said. The program also includes a snack time and outdoor playtime. Unlike a traditional daycare program, caregivers will not be allowed to drop their children off at the facility. “We want to utilize our center here in a simple enough manner, where caregivers can take what they’ve learned and use it at home,” Kolch said. Kolch graduated from the University of South Florida with a degree in the education field. She taught at Mango Elementary before becoming a stay-at-home mother. Her family was part of the YMCA for five years. During that time, she decided to reenter the workforce with the YMCA. “I love the YMCA,” Kolch said. “It has such a great mission and does great charity work. I wanted to do this. I can really help children out. The program is part of the YMCA’s early learning readiness program. But every program is nicknamed something different. Kolch hopes to name the Plant City program Play and Learn Together. As a bonus, caregivers will receive a month’s free membership for their families to the Plant City YMCA if they attend each class for two consecutive months. The program celebrated Oct. 17, its open house. About eight spots still are open, but Kolch said at 10 students, she will be able to grow the program to multiple days. Kolch also needs interns and volunteers to help run the classes. She hopes to partner with Hillsborough Community College’s early childhood education program. Bilingual volunteers are especially needed, because Kolch’s expects many of the clients to be Spanish speakers. The program offers a variety of stations to help children learn skills for school.